Genetically modified (GM) seeds are laboratory prepared that have desired traits such as drought resistant and tolerant and weed protected among others. GM seeds application has been growing the ground of its sustainability and increased productivity. As per International Service for the Acquisition of Agri-biotech Applications (ISAAA), “GM Crop cultivation has touched a new peak showcasing the 110-fold increase in adoption rate of biotech/GM crops globally from 1.7 million hectares in 1996 to 185.1 million hectares in 2016.” Biotechnology plays a vital role in increasing the per hectare production, which is most beneficial for the small farmers and landholders with small portions of land. The approval for commercial application of GM crops is important and over the period it has become a frequent practice in many countries. In South Africa and Sudan, application of GM seeds of maize, soybean and cotton in 2016 has increased the production by 80% in 2016 as compared to 2015. Also Brazil has increased its GM soybean production land area by 11% in 2016, becoming second largest producer of soybean after the U.S.
Goldstein Research analyst forecast that the global genetically modified seeds market size is set to reach USD 30 billion by 2025, growing at a CAGR of 6.82% over the forecast period. The factors such as technological advancement, approval to application of GM seeds varieties, increasing population and food security concerns are augmenting the growth of the market. The report covers the present ground scenario and the future growth prospects of the genetically modified seeds market for 2017-2025 along with the global supply and global revenue of the genetically modified seeds. We calculated the market size and revenue share on the basis of revenue generated from major players across the globe. We have forecast the market on the basis of number of GM seeds companies, data of GM seeds supply, import and export data of genetically modified seeds. On the basis of seed type, grain seeds accounted for largest market share of 58.3% in 2017 of the global genetically modified seeds market. Grains account for major staple crops such as corn, wheat and rice, thus it has the major demand from all over the world for consumption and thus impacting the growth in supply of GM seeds. Further oil seeds also have huge demand globally such as Bt Cotton, and thus it is expected to grow at a CAGR of 7.1% over the forecast period. Genetically modified seeds market outlook 2017-2025, has been prepared based on an in-depth market analysis from industry experts. 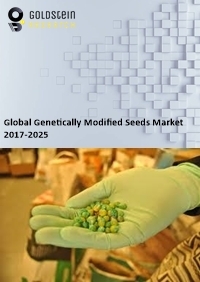 The report covers the competitive landscape and current position of major players in the genetically modified seeds market. The report also includes porter’s five force model, SWOT analysis, company profiling, business strategies of market players and their business models. Global genetically modified seeds market report also recognizes value chain analysis to understand the cost differentiation to provide competitive advantage to the existing and new entry players. There is a rising trend of innovating genetically modified seeds as per requirement of various regions all over the world. The GM seeds research and development is considered to have been the most intensive segment of all the agriculture research and development activities. The focus on the impacts of GM seeds on the humans and on the environment takes intensive research and development activities. The growing food security concern with the rising population where demand for agricultural products is expected to grow by 50% by 2050 is majorly driving the demand of GM seeds, that are environment sustainable, safe for human consumption and provides enhanced per hectare productivity from the limited land available for crop production. As per the soil, climate and availability of resources GM seeds are produced, thus enabling full utilization of the dry lands and unused lands. Further, the advent of new technologies such as vertical farming will limit the use of GM seeds. Vertical farming only requires controlled moisture and continuous light for the growth of plants on tall vertical towers. Vertical farming is a developing concept which eliminates the use of pesticides, synthetic fertilizers, herbicides, or GMOs. Based on geography, North America contributed the largest market share of 28.6.9% in global genetically modified seeds market owing to largest crop area cultivated with advanced agricultural technologies and instead of small farmers, farming is majorly done by the private players who have large capacity for application of GM seeds. North America market share is followed by Asia-Pacific region, which accounts for majority of the agricultural countries acquiring top position in various crop productions. What is the revenue of global genetically modified seeds market in 2015-16 and what would be the expected demand over the forecasted period?